Fixtures & Leaks – Our team is available to make repairs and seal up any leaks in the kitchen faucets or the water lines. If you are looking to replace the sink or faucets, we can remove the old appliances and install the new ones in no time. 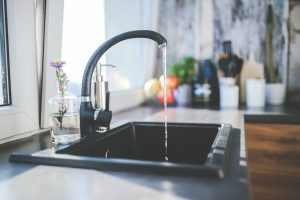 Drain Cleaning – Too many food scraps or debris in the drain can cause clogs that will back up the sink, create issues with the dishwasher, and cause stress on the water lines. We offer solutions to get the drain clean quickly and efficiently. Garbage Disposal Repair – A jam in the garbage disposal can cause wear and tear on the motor. If you are having to continuously reset the disposal, or it has become slow to clear the drain, it could be that the motor or blades have worn out and need to be replaced. We offer replacement and installation services for garbage disposal systems. Water Softener and Filtration – Water filtration and water softener systems remove harsh chemicals and tastes from the drinking water in your home. For installation and maintenance, give us a call at (310) 454-2010. Dishwasher Repair – The dishwasher is hooked into the water line system of your home. It is possible for a clog to form inside the water line leading from the dishwasher because of buildup of food or debris. A clog inside the drain of the kitchen sink can also affect the performance of the dishwasher. Build up in the water line will prevent dirty water from leaving the dishwasher and will stay trapped inside it. For more information about our kitchen plumbing services, contact us today. We are happy to answer any questions and concerns you might have. Our goal is to provide excellent customer service that is both affordable and reliable so you know you will get the best, long-lasting repair. Call now for service in West LA, Pacific Palisades, Bel Air, and Beverly Hills. Updated on June 15, 2016 at 3:58 pm by Sunset West Plumbing & Rooter.